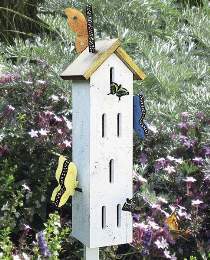 Expect butterflies to occupy this home year round. In the spring and summer months the house provides protection from birds and other predators. To survive winter, butterflies must either migrate south or hibernate. Those that hibernate seek a dark sheltered place for protection from the cold - like this Butterfly Box. Hang 5 feet above the ground. Measures 25"H x 8"W x 7"D. FULL SIZE patterns. Order the "Enjoying Butterflies More" Booklet by Jeffrey Glassberg separately. Butterflies are the type of wildlife people most want to see near their homes. This booklet tells how to attract butterflies to your yard and garden. You’ll learn about their behavior, stages of life, and how to identify what species of butterfly you’re watching. The booklet also offers tips on photographing butterflies and lists butterfly clubs and organizations you can join. 32 full color pages, 5 x 8 paperback. SAVE with the #9943 Special which includes both the plan and the book.